SUP35 and SUP45 are essential genes encoding polypeptide chain release factors. However, mutants for these genes may be viable but display pleiotropic phenotypes which include, but are not limited to, nonsense suppressor phenotype due to translation termination defect. [PSI +] prion formation is another Sup35p-associated mechanism leading to nonsense suppression through decreased availability of functional Sup35p. [PSI +] differs from genuine sup35 mutations by the possibility of its elimination and subsequent re-induction. Some suppressor sup35 mutants had also been shown to undergo a reversible phenotypic switch in the opposite direction. This reversible switching had been attributed to a prion termed [ISP +]. However, even though many phenotypic and molecular level features of [ISP +] were revealed, the mechanism behind this phenomenon has not been clearly explained and might be more complex than suggested initially. Here we took a genomic approach to look into the molecular basis of the difference between the suppressor (Isp−) and non-suppressor (Isp+) phenotypes. We report that the reason for the difference between the Isp+ and the Isp− phenotypes is chromosome II copy number changes and support our finding with showing that these changes are indeed reversible by reproducing the phenotypic switch and tracking karyotypic changes. Finally, we suggest mechanisms that mediate elevation in nonsense suppression efficiency upon amplification of chromosome II and facilitate switching between these states. (i) In our experimental system, amplification of chromosome II confers nonsense suppressor phenotype and guanidine hydrochloride resistance at the cost of overall decreased viability in rich medium. (ii) SFP1 might represent a novel regulator of chromosome stability, as SFP1 overexpression elevates frequency of the additional chromosome loss in our system. (iii) Prolonged treatment with guanidine hydrochloride leads to selection of resistant isolates, some of which are disomic for chromosome II. Translation is a very important and energy-demanding process for all living cells including the yeast Saccharomyces cerevisiae. Synthesis of ribosomal components is ultimately the main activity of the cell. Apart from copious rRNA molecules produced by RNA polymerases I and III, mRNAs encoding ribosomal proteins and ribosome assembly factors comprise at least 60% of the transcripts produced by RNA polymerase II [1, 2]; in addition, not only ribosome components but many other proteins are required for efficient protein synthesis. No wonder that this system is tightly regulated, and many of its components play a role in this regulation . The process of translation ceases when the translating ribosome encounters one of three stop codons. This step, termed termination, is ensured by the release factors Sup35p (eRF3) and Sup45p (eRF1). These proteins form a complex resembling tRNA; they act by binding to the stop codon and prompting release of the newly synthesized protein to the cytoplasm. Binding of tRNAs and release factor complex to the stop codons exists in a dynamic equilibrium which may shift if levels of any of these components are altered. If the equilibrium shifts in a cell bearing a gene with a premature termination codon (nonsense mutation), the effect of this mutation may be partially compensated for. This phenomenon is referred to as nonsense suppression. The most obvious reasons for nonsense suppression are mutations in tRNA and release factor genes ; in addition, partial inactivation of Sup35p deposited in amyloid aggregates ([PSI + ], ) was shown to result in a similar phenotype. Mutations in the release factor genes may be adaptive or counter-adaptive depending on the growth conditions, as easily illustrated by a simple example of a sup35 mutation partially restoring growth of an ade1-14 mutant strain on adenine dropout media but leading to sensitivity of this strain to elevated temperatures. Rich collections of spontaneous suppressor mutations in the SUP35 and SUP45 genes have been obtained and extensively characterized in several strain backgrounds with different suppressible nonsense mutations [6–9], one of them being 2V-P3982 with ade1-14 (UGA), his7-1 (UAA) and lys2-87 (UGA) and non-suppressor Ade−His−Lys− phenotype. Two sup35 strains from this collection were shown to switch from suppressor phenotype (Ade+His+Lys+) to non-suppressor (Ade±His−Lys−) phenotype spontaneously. Curiously, the non-suppressor phenotype was characterized by non-Mendelian inheritance, could be eliminated on media containing guanidine hydrochloride (GuHCl) and re-appeared after GuHCl-caused elimination, similar to known prions . This prion-like determinant associated with reduced nonsense suppression efficiency was designated [ISP +] for “inversion of suppressor phenotype”. Despite being similar to a prion with a clear link to a transcriptional regulator Sfp1p, a potentially prionogenic protein enriched in asparagine and glutamine residues , [ISP +] has a number of features which distinguish it from most “canonical” prions. Its propagation does not depend on the Hsp104 chaperone , which is required for propagation of other prions , and deletion of the SFP1 gene conveys a phenotype drastically different from the [ISP +] phenotype . In addition, [ISP +] strains have been found to contain not only the sup35-25 suppressor mutation, but also a missense substitution sup45-400. The combination of sup35 and sup45 mutations contributes to the development the suppressor phenotype, since introduction of plasmid-borne wild-type SUP45 into the [ISP +] strain leads to [isp −]-like suppressor phenotype . In presence of pre-existing suppressors, translation termination efficiency may be modulated by multiple factors including the Ψ factor , i.e. the [PSI +] prion , or an additional chromosome . Similar to suppressor mutations and prions, presence of an additional chromosome may confer adaptiveness or counter-adaptiveness depending on the conditions tested [17, 18]. Many natural isolates were shown to be aneuploid [19–21], and in some natural isolates prions were revealed [22, 23], which probably reflects the utility of these traits. In this work, we show that in an unstable strain copy number of chromosome II can modulate nonsense suppressor phenotype and resistance to guanidinium chloride. Our results also suggest that Sfp1p, a transcriptional regulator, is implicated in maintenance of chromosome stability. [ISP +] has been studied in a group of closely related strains mostly ascending to 25-2V-P3982 (a 2V-P3982 derivative bearing the sup35-25 mutation ). In recent works, the 25-25-2V-P3982 strain was used, which had been derived from 25-2V-P3982 through mating type switch . The strain has been stored in glycerol stocks with several episodes of partial defreezing; so, genetic identity of the original strains of the early 2000s and the strains used in this work cannot be guaranteed. For this reason, throughout this work we will refer to sup35-25 isolates as either Isp+ or Isp−. Isp+ stands for His−Lys− phenotype while Isp− refers to His+Lys+ phenotype; isolates of both types are Ade+. Recently, we compared the transcriptional profiles of two isolates presumed to be [ISP +] and [isp −] . In this work, we will refer to these isolates as p2 (Isp+, p for ‘plus’) and m2 (Isp−, m for ‘minus’), respectively (see below). We found a small number (~300) of differentially expressed genes which fall into two classes, those upregulated in the Isp+ isolate and those upregulated in the Isp− one. While genes of the first group formed particular functional clusters associated with nutrient assimilation and metal ion import, the second group of genes was not enriched in any particular functional groups and thus similarly lacked common reason for changing expression . However, genes of the second group were united by another feature, their chromosomal location. Hypergeometric test showed they were significantly enriched in genes located on chromosomes II and IX (p = 3 × 10−118 and p = 2 × 10−47, respectively). Plotting relative (Isp−/Isp+) gene expression values against gene position in the reference genome clearly illustrated the same tendency (Fig. 1a). In order to check how these data correspond to the previously reported gene expression data for disomic strains, we exploited the vast body of evidence generated for twelve different haploid disomic strains and accumulated in the work of Dephoure et al. . Indeed, the distribution of gene expression values looked very similar (Additional file 1: Figure S1), even though overall Pearson correlation of the expression profile of the Isp− isolate with expression profiles of strains disomic for only chromosome II or only chromosome IX  was not high (r = 0.38 and r = 0.20, respectively). However, sequencing read depth could provide an additional (and possibly more reliable) measure of chromosome copy number than the mRNA level. It could also indicate whether the isolates (even though unlikely) differ in some point mutations which contribute to the phenotype. Two isolates were chosen for whole genome sequencing. The Isp− isolate was a copy of same Isp− isolate used for transcription profile analysis (m2), which had been passaged on YEPD and then stored at −80 °C as a glycerol stock. The Isp+ isolate (p3) was a derivative of m2 obtained with transient SFP1 overexpression (see Fig. 2). First, depth of coverage analysis was performed (Fig. 1b, c). We indeed found a difference in chromosome II and IX copy number. Surprisingly, the Isp+ isolate (p3) showed non-integer coverage for chromosome IX (Fig. 1c), which probably means that it consisted of a mixture of monosomic and disomic cells. In agreement to the gene expression values, the Isp− isolate (m2) showed approximately two-fold higher coverage for chromosomes II and IX than for the other chromosomes (Fig. 1b). In addition, we compared single nucleotide variation data for the two isolates and did not find any “suspicious” positions which could have been selected for; chromosome II of the m2 genome was homozygous for the sup45-400, his7-1 and lys2-87 alleles. As the molecular difference between Isp+ and Isp− isolates turned out to be distinct from the prion-like determinant described previously, we asked whether it was also reversible. Thus, it was crucial to establish whether the chromosome copy number difference would be reproduced in newly obtained Isp+ and Isp− isolates. There are two known means to obtain Isp+ clones from Isp− ones, namely spontaneous appearance happening at a frequency of about 1 per 10,000 cells  and SFP1 overexpression elevating this frequency ~700-fold . There is only one known way to obtain Isp− isolates from Isp+ ones, GuHCl treatment . We employed these three methods and used m2 to obtain one spontaneous Isp+ isolate (p4; Fig. 2, lower part) and four more Isp+ isolates after transient overexpression of SFP1 (isolates p10, p11, p12, p13; Fig. 2, lower part); p3 was passaged on GuHCl-containing media five times to select six Isp− isolates (m4, m5, m7, m8, m9 and m11; Fig. 2, lower part). In addition, we used the oldest glycerol stocks available to recover Isp+ and Isp− isolates p1 and m1. Finally, we tried to obtain strains parental to 25-25-2V-P3982 (sup35-25 MATa) and used in earlier works, 25-2V-P3982 (sup35-25 MATα) and 2V-P3982 (SUP35 MATα). 25-2V-P3982 was recovered from glycerol stock (Fig. 2, isolate 25). No stocks of the original 2V-P3982 strain were available but its [PSI +] derivative was stored; we recovered it (Fig. 2, isolate [PSI +]) and also treated it with GuHCl to obtain a prionless strain (Fig. 2, isolate [psi −]). Then, we employed microarray-based comparative genomic hybridization (aCGH) to infer copy number of each chromosome in each of these isolates (Table 1). Chromosome II copy number perfectly correlates with the Lys+/Lys− phenotype of the particular isolate: to sum up, all 7 Isp+ isolates tested were monosomic for chromosome II while all 8 Isp− isolates had this chromosome amplified. In addition, we found some variability in copy number of chromosomes I, IX and XIV (Table 1). We could not associate chromosome I or XIV disomy with any changes in nonsense suppression efficiency. Chromosome IX copy number might influence his7-1 suppression efficiency since m1, the only Isp− isolate monosomic for chromosome IX in our analysis, is characterized by poorer growth on histidine dropout medium than the other Isp− isolates; however, we consider this unlikely as the original Isp− isolate has been previously shown to suppress both his7-1 and lys2-87 . Our results show that Isp+ clones isolated after transient SFP1 overexpression lose extra chromosomes. Thus, SFP1 overexpression might elevate the frequency of extra chromosome loss. The simplest explanation would be that SFP1 overexpression, which is toxic for the cell, might be even more toxic for disomic cells, allowing for selection of euploids. However, this was not true; moreover, SFP1 overexpression was even more toxic for Isp+ isolates (Fig. 3). In the case of the reverse transition, Isp+ to Isp−, selection for resistance to GuHCl may take place. [isp −] isolates had been shown to be more resistant to 5mM GuHCl than [ISP +] ones ; we confirmed this results (compare upper and lower lines at Fig. 4). Curing of prions with GuHCl depends on Hsp104  but the [ISP +] prion had been shown to be independent of Hsp104 . What happened when strains were treated with GuHCl is unclear. We passaged an Isp+ isolate on either YEPD or YEPD with GuHCl five times and then compared the phenotype (Fig. 4). GuHCl treatment led to selection for GuHCl-resistant isolates in Isp+ with simultaneous selection for Lys+ (Isp−) clones. Thus, amplification of chromosome II might be one of the mechanisms of adjustment to GuHCl. As we show, chromosome II ploidy state correlates with the efficiency of suppressor phenotype, i.e., growth on histidine or lysine dropout media. This phenotype might be associated with marker nonsense mutations his7-1 and lys2-87 used to assess nonsense suppressor efficiency, as both genes are located on chromosome II. We chose one of these marker genes, his7-1, and checked whether introduction of an additional copy of this allele on a centromeric plasmid would produce a result similar to chromosome amplification. Indeed, an additional copy of his7-1 did elevate growth on histidine dropout medium without affecting growth on lysine dropout medium (20 independent transformants were checked; a representative clone is shown at Fig. 5). However, this effect was not strong enough to mimic the Isp− phenotype (Fig. 5, compare lines 2 and 3). Thus, His+ phenotype of the Isp− isolates depends on the his7-1 copy number, but there might be other contributing factors. In this work we show that the phenotypic difference between the Isp+ and Isp− isolates depends on chromosome II copy number. This finding is unexpected since these isolates were originally described as different in their [ISP +] prion state [10, 11]. The original suppressor sup35-25 isolate was not preserved, so we cannot directly determine whether it was disomic or displayed marked nonsense suppression for another reason. However, progeny of a hybrid of sup35-25 [isp −] and SUP35 strains had shown monogenic segregation of the suppressor phenotype [6, 10] while a hybrid of sup35-25 [ISP +] and SUP35 strains showed deviation from 2:2 segregation . If this Isp− strain were disomic for chromosome II and the disomy contributed to the suppressor phenotype, as we see in the strain studied in this work, deviation from monogenic segregation would have been observed in the former, but not in the latter case. These data suggest that the Isp+/Isp− phenotypes studied in this work represent phenocopies of the original phenotypes determined by presence or absence of the [ISP +] prion. We have shown that transitions from Isp+ to Isp− phenotype and vice versa are indeed associated with changes in chromosome II copy number (Fig. 2 and Table 1). However, the question why these transitions happen still remains. Spontaneous appearance of Isp+ clones can be attributed to accidental loss of the extra chromosome in cell divisions facilitated by the fact that Isp+ clones grow slightly faster than Isp− ones . However, it is unclear why overexpression of SFP1 elevates the frequency of extra chromosome loss. Increased level of Sfp1p might modulate expression of some target gene regulating chromosome maintenance or Sfp1p itself might interact with such regulator. Chromosome loss can happen due to unrepaired double strand breaks or defects in chromosome segregation. SFP1 overexpression affects cell cycle, most probably causing cells to pause in G2 , so we can speculate that cells overexpressing SFP1 could either have more double strand breaks or be defective for double strand break repair or spindle assembly. The reverse transition, from Isp+ to Isp−, might be associated with selection for GuHCl resistance. It is worth emphasizing that while 5 mM GuHCl inhibits growth of yeast cells (Fig. 4, compare left and middle panels), growth of Isp+ isolates is inhibited by 5 mM GuHCl more than the growth of Isp− isolates , and we confirm this result (Fig. 4). GuHCl resistance might be caused by increased level of Hal3p (Sis2p) reported earlier  or also by some gene located on chromosome II. Emergence of aneuploid clones in response to a stressful condition is similar to other reported cases such as chromosome III amplification in response to heat stress or chromosome V amplification as an adaptation to high pH  as well as chromosome XIII disomy making gal7 strains galactose tolerant . Interestingly, chromosome II disomy has been already described in some laboratory strains as a compensatory mechanism. It was shown to arise in response to polyQ toxicity due to the Sup45 protein  or to provide viability for strains deleted for the hta1-htb1 locus due to the increasing dosage of the HTA2 and HTB2 genes . As only some of the clones growing well on GuHCl-containing media are Lys+ and further prove to be disomic for chromosome II, we suggest that there are multiple ways to adjust to high GuHCl concentrations toxic for the cell, one of them being chromosome II disomy associated with the Isp− phenotype. We show that chromosome II copy number (monosomy/disomy) perfectly correlates with the Isp+/Isp− phenotype of the particular isolate, suggesting that it is the reason for the difference in growth on histidine or lysine dropout media. The simplest explanation of the mechanism would be increased dosage of the his7-1 or lys2-87 mRNA, respectively. We checked this hypothesis and showed that introduction of an additional copy of his7-1 indeed leads to His+ phenotype of an Isp+ isolate. We can speculate that the same mechanism takes place in the case of lys2-87. However, as an Isp+ isolate with two copies of his7-1 still produces slightly less His+ clones than an Isp− isolate (Fig. 5); this might be caused either by the missense mutation in the plasmid-borne his7-1 copy or by influence of some other gene(s) located on chromosome II or regulated by chromosome II genes. Among such candidate genes could be several tRNA genes or the sup45-400 allele, as introduction of wild-type SUP45 to Isp+ strains has been shown to mimic the Isp− phenotype . To the extent of our knowledge, this is the second reported case of nonsense suppressor phenotype modulated by aneuploidy, the first being chromosome VIII disomy elevating translation termination efficiency due to SPB1 duplication . Finally, there is a question why many of the isolates checked in this work contain additional chromosomes. Our data do not allow us to estimate the frequency of chromosome gain, but still the proportion of aneuploid isolates in our analysis, the variability of karyotypes and non-integer coverage data suggest significant genome plasticity. The 25-25-2V-P3982 strain possesses missense mutations in SUP35 and SUP45. These genes have been linked to chromosome stability , but as we also found additional chromosome I in a SUP35 SUP45 strain ([psi −]), we consider sup35-25 or sup45-400 an unlikely cause of the genome instability. 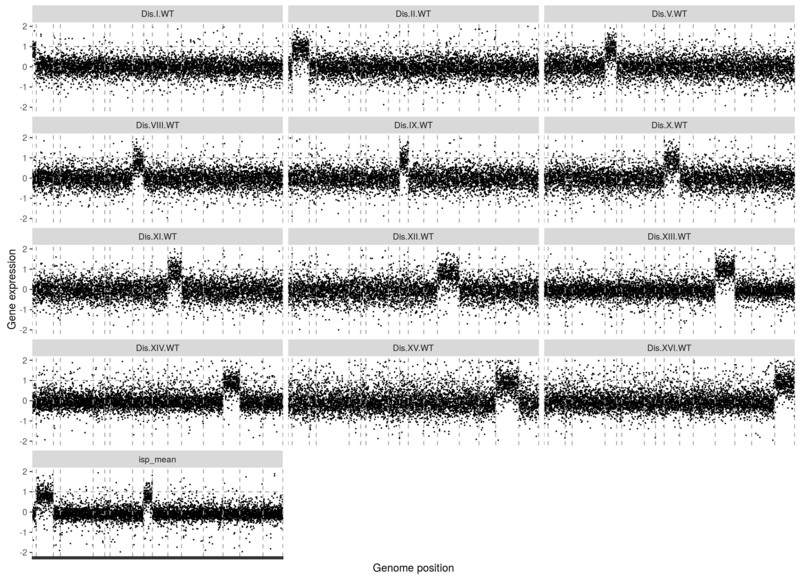 In an attempt to find other genes which could be connected to genome instability in 25-25-2V-P3982, we compared the list of 46 genes with premature stop codons found in the genome of this strain  to the curated list of 692 chromosome instability genes . Intersection of these lists returned three genes, ADE1, MNL1 and CNN1. The ade1-14 allele has been used as a marker of nonsense suppression in multiple works  without reports on genome instability, and in addition, it is partially suppressed in the strain used; thus, we consider ade1-14 an unlikely contributor to the observed chromosome instability. MNL1, encoding a protein residing in the endoplasmic reticulum and acting in glycoprotein degradation , was detected to influence genome stability in A-like faker screen , but the mechanism behind this effect is unclear. The third gene, CNN1, encodes a kinetochore component; deletion of this gene had been associated with chromosome segregation defects in several works [35, 36]. CNN1 contains a premature stop codon in 25-25-2V-P3982 but not in other related strains of the Peterhof genetic collection  and might contribute to the observed chromosome instability. In our experimental system, amplification of chromosome II confers nonsense suppressor phenotype and guanidine hydrochloride resistance at the cost of overall decreased viability in rich medium. SFP1 might represent a novel regulator of chromosome stability, as SFP1 overexpression elevates frequency of the additional chromosome loss in our system. Prolonged treatment with guanidine hydrochloride leads to selection of resistant isolates, some of which are disomic for chromosome II. P-2V-P3982 (clone [PSI +]) (MATα ade1-14 his7-1 lys2-87 ura3Δ0 thr4-B15 leu2-B2 [PSI + ]) was derived from 2V-P3982  with transient SUP35 overexpression (Kirill V. Volkov, unpublished data). Clone 25 ascends to the 25-2V-P3982 strain (MATα ade1-14 his7-1 lys2-87 ura3Δ0 thr4-B15 leu2-B2 sup35-25 sup45-400) described earlier . 2-P-2V-P3982 (clone [psi −]) is derived from P-2V-P3982 with passaging on YEPD medium with 5mM guanidine hydrochloride three times. 25-25-2V-P3982 (MATa ade1-14 his7-1 lys2-87 ura3Δ0 thr4-B15 leu2-B2 sup35-25 sup45-400) was described earlier [11, 13, 33]; generation of isolates is summarized in Fig. 2. Either PSL2  or p1 genomic DNA was used as euploid control in aCGH experiments. Standard yeast media [38, 39] with modifications were used. Guanidine hydrochloride (Sigma G-3272-100G) was added to a final concentration of 5 mM. Yeast strains were cultivated at 26 °C, E. coli cells were cultivated at 37 °C. Yeast transformation was carried out according to the standard protocol  with modifications. Cloning was carried out according to standard protocols [41, 42]. To obtain pRS316-his7-1, his7-1 with flanking regions was PCR amplified from genomic DNA of p3 with primers HIS7_F_HindIII_ (GTAACAAGCTTTCTTTCCTCTACCACTGCCAA) and HIS7_R_HindIII_ (ACCATAAGCTTTGGTACAATTTCTCCAAGCTG) and ligated into RS316  at HindIII sites. In addition to a nonsense mutation A299T leading to premature stop codon at position 77 , it contains a PCR-induced substitution T947C leading to a missense mutation L316P. pRS426-SFP1, a pRS426  derivative containing SFP1 under the control of its own promoter, was described earlier . pRS316  and pRS426  were also used as control vectors. DNA extraction for whole genome sequencing, library preparation and data analysis methods was described earlier . DNA extraction for PCR was performed as described in . DNA extraction for aCGH, labeling and hybridization were performed as described in  except that yeast strains were grown at 22 °C for four days. Custom 8x15k design (AMID 028943) Aligent arrays were used; the slides were scanned and then analyzed with GenePix Pro 6.0 software. In each case, phenotype of the clones used for nucleic acid extraction was checked at the moment of extraction with spotting on selective media. Microarray data analysis was performed in R  with limma ; ggplot2  was used for plotting. Bowtie2  was used for short read alignment. Mapping coverage was plotted with Qualimap . aCGH data were analysed with CGH-Miner Excel add-in . Details of next generation sequencing data analysis and expression microarray data analysis are provided in [24, 33], respectively. The authors would like to express their gratitude to Mikhail Belousov and Polina Lipaeva for critical reading of the manuscript and useful suggestions and other lab members for discussions. We are extremely grateful to Thomas Petes for reagents and the possibility to carry out CGH experiments, to Margaret Dominska and Anthony Moore for technical help, and to Petes lab members for discussions. The research was supported by research resource center “Molecular and cell technologies” of St. Petersburg State University. The authors acknowledge the Saint-Petersburg State University for grants 15.61.2218.2013, 1.37.291.2015 and 1.42.1394.2015 and the Presidential Grant Council for the grant NSh-9513.2016.4 for funding this work. The publication cost is covered by the authors. The datasets supporting the conclusions of this article are available in the NCBI SRA repository, SRR2533174 (https://www.ncbi.nlm.nih.gov/sra/SRR2533174/) for isolate p3, and SRR2533175 (https://www.ncbi.nlm.nih.gov/sra/SRR2533175/) for isolate m2, and in the NCBI GEO repository, GSE52189 (http://www.ncbi.nlm.nih.gov/geo/query/acc.cgi?acc=GSE52189) and are included within the article and its Additional files 1, 2, 3 and 4. Genome browser for combined data for the 25-25-2V-P3982 genome is available as a custom hub at the UCSC genome browser (http://genome.ucsc.edu/cgi-bin/hgHubConnect#publicHubs; connect Peterhof_yeasts). PD and LM initiated the project. PD performed the experiments. PD, LM and GZ analyzed the data and wrote the manuscript. All authors read and approved the final manuscript. R Core Team. R: A Language and Environment for Statistical Computing. Vienna, Austria; 2015. Available from: http://www.r-project.org/. Accessed 10 Dec 2015.